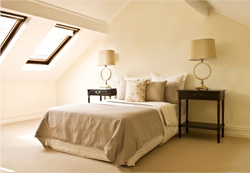 Interloft Conversions Ltd is the top choice for people looking to make the most of their attic in Wakefield. Why use the space for storage when you could convert it into a beautiful bedroom, bathroom or office? A loft conversion is one of the simplest ways to expand the available space in your home – and it will increase the value too. At Interloft we understand that functionality and design are of the utmost importance, and we combine both to provide you with a beautiful loft conversion that will suit your needs and budget perfectly. With over 15 years’ experience of providing customers with attic, dormer and part loft conversions, we are ideally placed to serve Wakefield and the entire region of Yorkshire. Using CAD design and drawings along with the experience of our team, in addition to working alongside you every step of the way from initial design to completion, will ensure your attic conversion is exactly as you want it. All loft conversions are completed within 6 to 8 weeks and in most cases require no planning permission. With a ten year guarantee on all attic conversions and professionally trained in-house staff, we are the only choice for loft conversions in Wakefield. We never use sub-contractors so you can be assured of a friendly and reliable service. For a free, no obligation quote for all loft conversion projects please call 01924 684 034.